Are you looking to get in shape for summer fast? 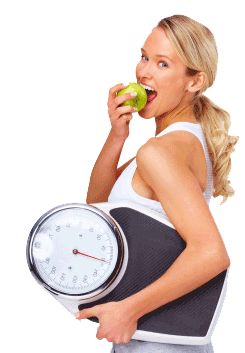 Are you wondering how to ditch the diets and lose weight on a healthy eating plan instead? Few, readily available, fresh ingredients – not a bunch of exotic ingredients that you’ll never use again. Minimize packaged or highly-processed foods – and focus instead on seasonal, whole foods with a special emphasis on vegetables and fiber content. Make recipes easy to plan, prepare and cook – something that busy professionals and parents can quickly cook with minimal cooking experience. Provide nutritionally balanced options that are lower in calories but maintain delicious taste. You asked so here it is! I have created a brand new program that I’ve labelled the “200-Calorie-Fix”. 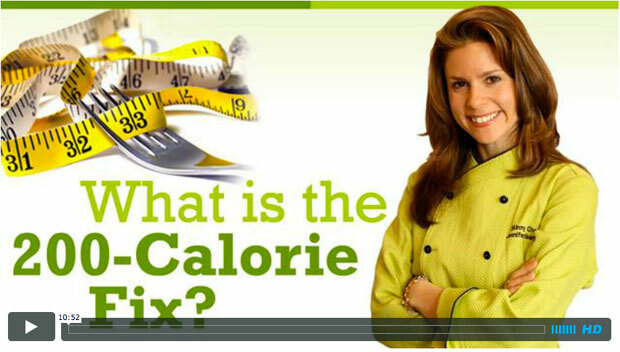 Each recipe is designed as a single-serving for 200 calories or less. Now, I am not saying that you should only eat 200 calories per day – but the way I created the recipes, you get serious portion sizes that leave you satisfied without having to calculate calories or sacrifice taste. If you’re trying to save on groceries, this program is great because each recipe only uses a few healthy, easily available ingredients. Plus, those wholesome ingredients are also used in other recipes, so there’s little waste. Quick and easy to prepare, the healthy recipes are ideal for working professionals or when you’re on-the-go with minimal prep & cook time of 10-15 minutes. This plan lets you gradually change your eating habits, without forcing you into exactly prescribed meals. Just mix-and-match interchangeable 200-calorie options to your specific taste and mood. To make it even easier for beginners, each recipe comes with a quick how-to video, nutritional content, carbs and calories as well as detailed instructions and swap-outs (for example to make recipes gluten-free). When you start on a healthy eating program, you don’t generally have the spray oil or the spices necessary to cook healthy dishes. With this program, you focus on a few simple, everyday ingredients, print a list and get right on track! While each recipe is designed as a single serving, there’s many that can be tweaked so you can “cook once, eat many times” throughout the week. Practical recipes for delicious, tasty food that people really eat, focusing on home-made meals with leftovers that could serve as lunch the next day. Ideal for diabetics, this calorie-based plan is easy to track and helps you lose weight without constant calorie counting. Recipes contain healthy ingredients you may already have or could easily find, with some new items to add to your repertoire. Plus easy substitutions are built right into the plan so you don’t need a lot of advance planning. Many recipes are appropriate for toddlers, packaging the necessary nutrients, vitamins and minerals into natural foods that are easily absorbed by the body. All content is immediately available in our secure membership area, and videos are supported on desktops, laptops, iPad, iPhone and Android devices.